Every time I mention the phrase "Super-Tuscan" I seem to either be given me an eye roll or a shrug of the shoulder. In one camp, insiders who are so-over this phenomenon of old world wines made in a predictable international style and the other camp filled with folks who either don't know or just don't care. But for wine drinkers like me, who don't want spend an arm an a leg on a Brunello everyday and are tired of rustic Chianti Classico's who at times can nearly cost as much as an ST, I really think you need to take another look at Super Tuscans [IGT]. Yes I will freely admit the buzz and fanfare has died down a bit. But I think that is a good thing, it means you can get some these wines at far more reasonable prices, now that buzz has worn off and really who doesn't want to drink more, for less. I happened upon a discussion, with a Mr. Mannie Berk of the Sonoma-based Rare Wine Co. who was quoted in a recent article authored by the WSJ's Ms. Lettie Teague. The gist of the article was about the supposed "decline" of these super-tuscan style wines,"The market for Super-Tuscans is pretty soft," he said. And, in an echo of Hess, Berk added, "People are looking for a wine with transparency—a wine that screams that it’s from a place." Generically he says "people", in context meaning to me a large majority, but it's my contention that the folks described in his statement are actually what I refer to as "insiders" a loud and persuasive minority who advocate to only drink wines that represent place [which again is just fine, but don't tell me I have to]. Too Generic: However, the rest of "ordinary" wine drinkers are looking for a wine that screams, I taste good, have polished tannins, spent some time in barriques and have good acidity. If you consider yourself and insider, whose passion in life it's to drink wines that screams I'm from a "place", please have at the vast stores of Chianti Classico's, which irrefutably scream [but only sometimes yell] they are from a dry, dusty, tannic and austere place. Some folks like that style and I say more power to them, great enjoy it. Frankly, I don't believe too many folks want to hear someone pontificating to them from some ivory wine-tower, that only a vino which screams [hopefully not a primal scream] it's from a certain place, is the end all and be all. Don't get me wrong, there are plenty of examples of delicious CC's out there on the market, but in general most fall into the austere category, but they do scream I'm a wine from a place full of tradition, structure, without flaws and unfortunately without a lot of tasty flavors. Too Expensive: The other fallacious argument out there is that the majority of the Super Tuscan will set ya back three figures a bottle [which they can], a big fat Benjamin smack-down waiting to happen to the unsuspecting wine drinker. Where you really find this statement to be true is in American restaurant's with bloated over-priced wine-lists, but retail is a whole different story in most cases. Frankly, folks I don't have one bottle in my collection [over 300] which cost more than a Benjamin. I proudly and freely admit that, because you don't have to spend more than a Benjamin for even a great bottle of wine. If some one tells you that you do, they are leading down the primrose path. If you wanna drink good to great juice without breaking the bank, then stick around because the wines I review can be found on "The intersection of where great wines meet reasonable prices". This will be the fourth ST, I've reviewed that falls under the $100 price range. 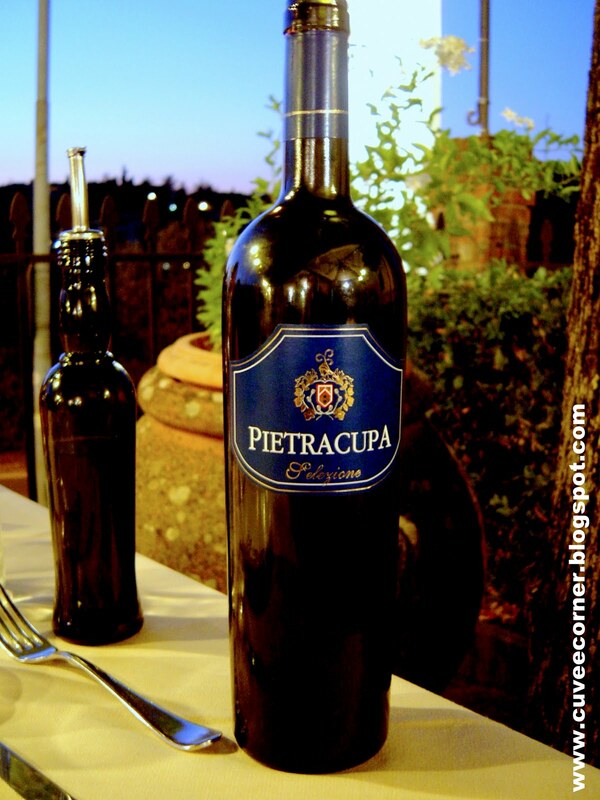 Here's a link to another story about "affordable" Super Tuscans. So while reclining here pool-side in pleasantly warm Phoenix, Arizona I threw open my wine journal, discovering a wine I had on my trip to Tuscany, which I had not put into a review. I discovered this wonderful wine while dining at a wonderful Tuscan ristorante, called Pietracupa [same as the wine] just outside Castellina in Chianti. A Super Tuscan which is not expensive, but delivers wonderful mouth coating dark and red fruit flavors, spread over polished tannins. I even found one place in sunny Florida that has this wine in stock and ready to go. Swirly-Swirl, Sniff and long Slurp: In the glass a ruby-red core, throws some nice legs against the glass. In the nose lots of plum, dark cherry aromas of espresso, licorice, bittersweet chocolate, vanilla. After the first long slurp, I was delighted to find a full-bodied, heady wine. A wonderful flavor profile danced across my palate, ripe red cherry and blackberry fruit, licorice and subtle earthiness complements, zesty acidity and a touch of tar all combine for a long, generous finish. A perfect accompaniment to a host of Italian fare. Price and where to Purchase: You can find this delicious blend of 60% Sangiovese and 40% Cabernet Sauvignon waiting for you at Distinctive Wines, where they are selling a 750ml bottle for just $27, a steal of a deal [as I paid more than that in Italy]. What's the Score: We all want to know the score whether it's sports or you just want the "skinny" on a particular topic, ok so here it's, I scored this wine 92 points. That's all I have for you today folks, check back next time when I will delve deep into the Wines of Chile tasting, you don't want to miss that review. More great tasting wines and all well under the three figure category. See ya all next time, until then sip long and prosper, cheers!